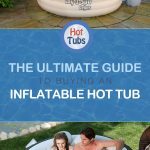 This inflatable hot tub surround has a number of uses. 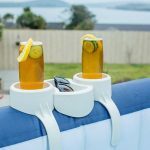 It can be used with two other pieces to form a surround for the hot tub or it can also be used as a step into the hot tub to make it more accessible. If you already own a Lay-Z-Spa hot tub then the Lay-Z-Spa Hot Tub Steps and Surround is the ideal accessory for any model. The surround is made from Tri-Tech material which is the same material that is used to produce Lay-Z-Spa hot tubs. It also features I-beam technology which holds the shape of the surround. This means that it can be inflated and deflated as many times as needed without having to worry about the product losing its shape. 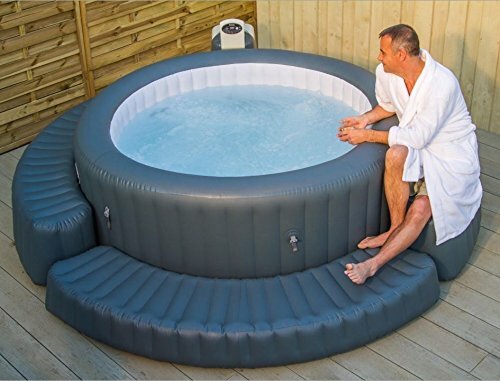 Each section of the Lay-Z-Spa Hot Tub Steps and Surround measures 1.98m x 40cm x 40cm and it has been designed so that three sections attached together will completely surround any model of Lay-Z-Spa hot tub. If you choose to use the product as a surround then you will find that this has many uses. Each section attaches to the next piece via velcro and once it has been fastened it will remain very secure while still being easy to take apart again when needed. The surround provides somewhere to sit when you are not in the tub and is large enough to lie down on if you want to do a spot of sunbathing. It is also an ideal place to keep towels and other things that you may want to keep close to hand. Using the Lay-Z-Spa Hot Tub Steps and Surround as steps also means that everyone is able to use the hot tub. The hot tub may be too tall for children to climb into but they will be able to get in and out by themselves if there are steps. Always remember that children should never be left in or near the hot tub unattended. An inflatable hot tub looks complete when paired up with a set of steps. 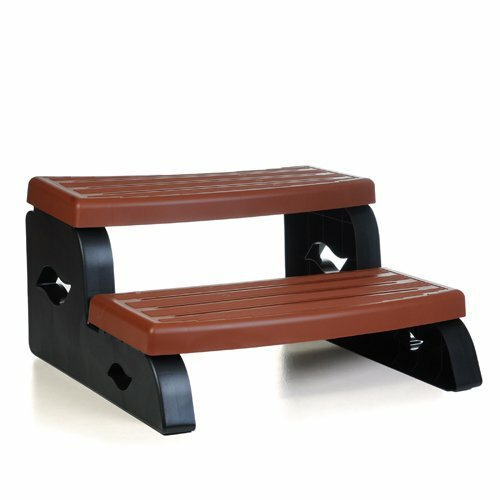 A set of steps may seem like a trivial things but their importance should not be ignored as they are a vital accessory. When it comes to choosing a set of steps there are many things to look for but ensuring that they are simple to clean and sturdy is always a good place to start. Non-slip covering is always a welcome addition as is extra storage space within the steps themselves. They come with many benefits. Hot tub steps are convenient and this is the obvious benefit as they make it easy to enter and exit the hot tub. It really is all about ease of access and a hot tub that is easy to access instantly become easier to use which is why they offer a certain level of convenience. The area surrounding a hot tub can become extremely slippery when wet but steps bring a level of safety. Wet feet on a plastic surface is a recipe for disaster and can lead to some extremely bad injuries. A good set of steps that have a non-slip covering will ensure that your balance is maintained when it comes to getting in and out of the hot tub. With a hot tub comes the accessories and chemicals that have to be stored somewhere, which is why steps with a storage area are an added bonus. Keeping these chemicals safe and out of the way will ensure they cannot be reached by children or pets but they also stay dry. Many people purchase spa’s because they have a health problem such as joint problems which means that a hand rail can make the world of difference. It is an element of safety and security and convenience all rolled in to one but they can really make life a lot easier.